I’m sure you have all seen at least one tabloid cover and thought, ‘I wish I looked like that’ or ‘I wish I could be like that’. Caitie is here to tell you that it’s not real. Most of the things you see in tabloids are lies, such as gossip about who an actor is going out with, or that Prince Harry was going out with a pop star. I think a lot of things about tabloids – mainly that even if it was true it has absolutely nothing to do with us. Another thing bad about tabloids is air brushing (or photoshop) you have probably all heard of it and it is actually damaging young girls like you and me. If you don’t know what it is it’s when the press take pictures of famous people and make them skinny and give them no spots or blemishes although no one wants blemishes or spots everyone gets them and it is unrealistic to not have anything like them. This sort of thing makes young girls want to look like that therefore it is one of the reasons anorexia is such a problem because young girls want to be perfect like they think the stars of the world are. Air brushing also causes low self esteem and makes you think you are not perfect but everyone is perfect in their own way. I can’t stop you from buying tabloids but I can tell you that the things you see are not true. Stars like Adele who have been told by the press to lose weight are proof that you are your own person you don’t have to be told what perfect is. Celebrities are famous for a reason they have talent and we should like them for that and not because they are skinny and have no spots. If you look closely at this before and after air brushed picture of Beyonce you will see how the photographer has edited out spots and simple creases in her skin. 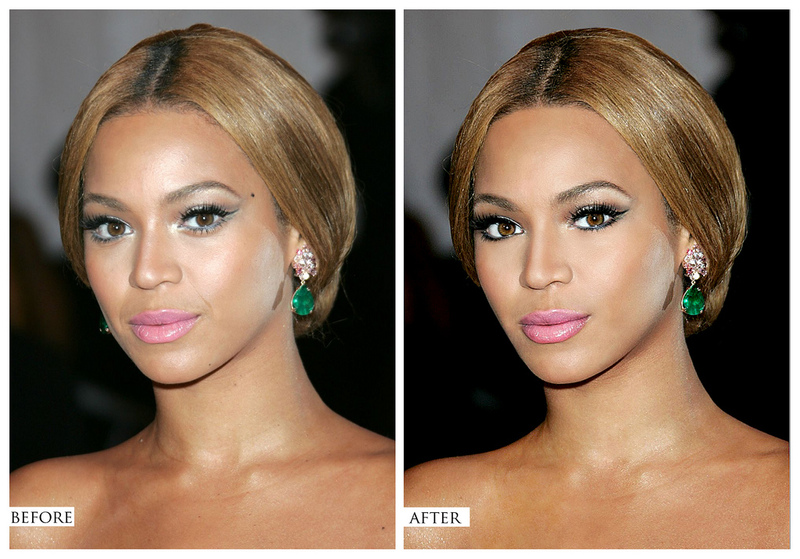 Beyonce and many other stars are beautiful without being edited from true to fake. It is quite odd really because if you look back to around the 1960s or 1950s the woman girls looked up to was Marilyn Monroe and although she was amazingly pretty she was a curvy girl. If you look around now the women we are supposed to look up to are skinny people like Mary-Kate and Ashley Olsen. Even though there is nothing wrong with being thin you don’t need to pressured into it. Don’t let the media turn you into a fake. Hi! My name is Caitie. My favourite colour is Scarlett and that is also my middle name. I play the violin and the ukulele I also sing in county choir and I am in Gilbert and Sullivan group (we sing and act.) As you can probably tell I like music but I also like sports I am in my school athletics club (I do javelin.) I am 12 years old and I will soon be going into year 8. Search on YouTube celebrity photo shopped before and after. It’s shocking the amount of celebrities who sell their body to magazines and products just for us to find out that their photo shopped! Yes it does have to stop it’s shocking how many celebrities are pretty much fake i am just glad some people my age know what is going on in tabloids. I agree, people do not care if you are pretty or not! Like Beyonce, she is one of my favourite singers and I do not care if she has a spot! What I think is she should just get rid of her make up and look natural! She is SO beautiful. what the tabloids don’t understand is how much this damages people, to think that they were the freak with spots, or greasy hair and that you need to have no blemishes to be a great person. I think this is awful. It makes girls wish they looked the way the celeb does in the picture when they don’t in real life.